62 April 1917. W.C.T.U. met in Cong. church with 14 present. After singing Italian Hymn, Mrs. Lincoln read Ezek's vision of he waters, and led in prayer. Min. read and approved. A discussion followed in regard to Mrs. Hale coming to the Co. It was thot that she should be sent to other towns in the Co. to organize unions. The Suffrage Amendment reported passed by the Legislature. 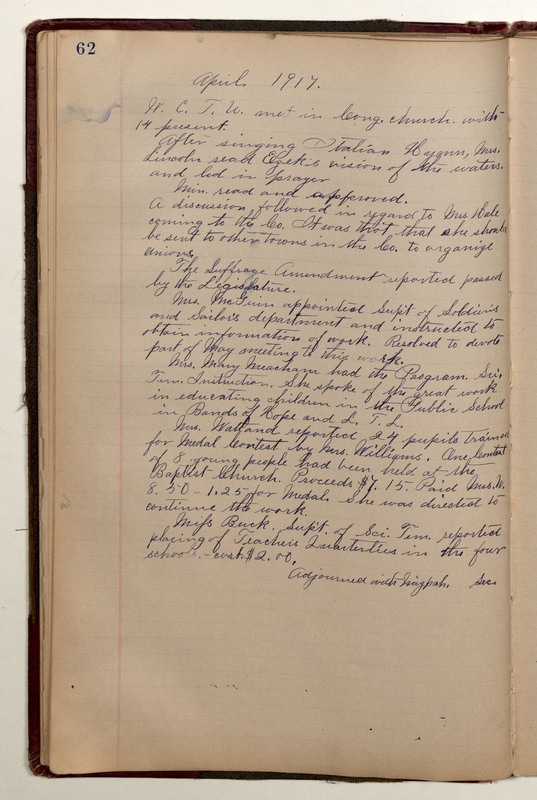 Mrs. McGuin appointed Supt of Soldier's and Sailor's department and instructed to obtain information of work. Resolved to devote part of May meeting to this work. Mrs. Mary Meacham had the Program. Sci. Tem. Instruction. She spoke of the great work in educating children in the Public School in Bands of Hope and L.T. L. Mrs. Watland reported 24 pupils trained for Medal Contest by Mrs. Williams. One Contest of 8 young people had been held at the Baptist-Church. Proceeds $7.15. Paid Mrs. W. 8.50 - 1.25 for Medal. She was directed to continue the work. Mifs Buck, Supt. of Sci. Tem. reported placing of Teacher's Quarterlies in the four schools -- cost. $2.00. Adjourned with Mizpah. Sec.